Achieving optimal health and wellness is an ongoing process and there are no shortcuts in this endeavour. As such, it can be a lot easier if you try to set different targets every week until you eventually learn to take control of your own well-being. Also, your trusted Gold Coast chiropractor here at Hinterland Chiropractor can help you in your quest to achieve better health and enjoy more out of life. The well-being of your spine has a strong impact on your overall wellness. All in all, chiropractic is a holistic approach when it comes to keeping your mind and body in perfect condition. It focuses on preventing health issues by improving your body’s innate ability to heal itself. Moreover, it is a safe and all-natural therapy. You do not have to deal with any side-effects. 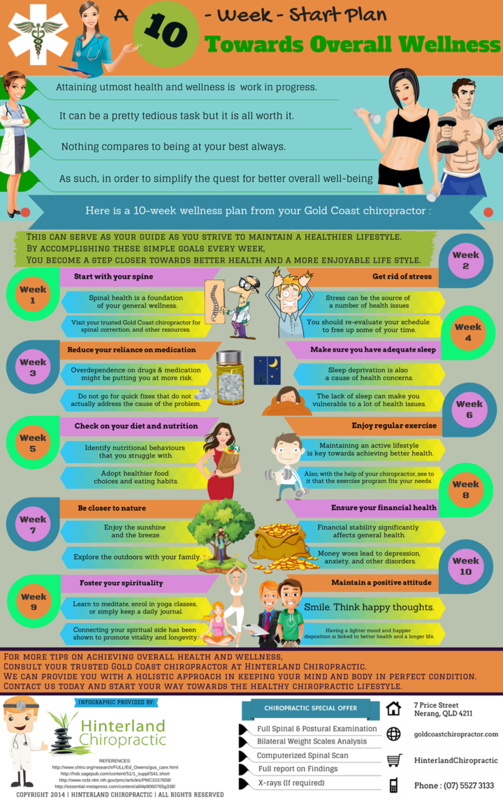 You can start living the chiropractic lifestyle today by following this 10-week wellness plan. For expert advice on your overall health and wellness, consult your trusted Nerang chiropractor here at Hinterland Chiropractic. We are dedicated to helping families on the Gold Coast achieve total well-being by providing them with the best lifetime health care. We have been doing this for over 20 years now. Experience the benefits of chiropractic with us. Call us today on (07) 5527 3133 or simply book your appointment online.